Signed W.E. Ryan tugboat print entitled "Evening Reflections.". 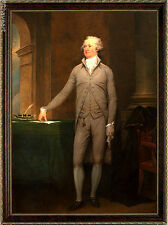 Alexander Hamilton, by John Trumbull, ca. 1806. Andres Orpinas Art Print Country Home on Pond Framed Signed 10" x 8"
Allen Hawks “ The Flying Cloud 1851“ - Lithograph Print -Allen Hawks Gallery Gloucester MA- Sailboat - Nautical. 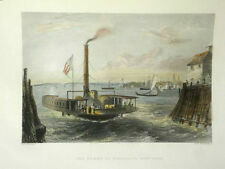 Andres Orpinas Art Print Fishing Boat NEW 8" x 10"
This is an Andres Orpinas nautical art print. It is 8" x 10" and it is new and sealed. 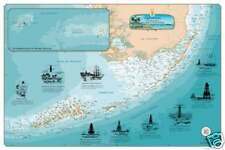 This beautiful chart of the Florida Keys Lighthouses shows the keys, reefs, and water depth contours in exquisite detail. In addition, there are nine custom pen and ink drawings of the most popular lighthouses around different areas of the keys. 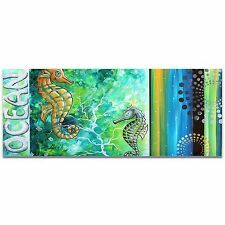 Nautical Art Print. Moulding: Professional Solid Wood Black with GoldTrim. De Windstoot 1707. KENWOOD WINERY 1979 PRINT “SEA-WOLF AT THE LIGHTHOUSE. VERY THICK PAPER STOCK. COLORS BRIGHT. GOOD FRAMABLE USED CONDITION, SEE PHOTO CLOSEUPS FOR CONDITION. The paper size is approx. From: The Black & White - London - 1893. DEPICTING ~Sailing, Nautical, Moonlight On The Waters, by Schleich. TITLE ~ Nautical, Moonlight On The Waters, by Schleich. FROM ~ The Aldine, New York, 1873. CONDITION ~ Minor and normal signs of age. This is a Kerry Hallam lithograph print done by the Donald Art co in 1986. This is a really neat Nautical Sailboat scene. Interesting item. It's a print of a painting (initials HP maybe or LP or LD or...) of the USS Hartford in 1863; printed by American Lithographic Co, NY; Copyright 1905 by E I DuPont Co. Wonder why they'd make this? Seems ot be rare, a quick search i find nothing about it, anywhere. Love to hear the story! . CONDITION: Minor and normal signs of age. Very Good Condition Small Crack in Lower Corner of Glass. 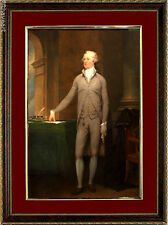 FINE ART REPRODUCTION PAPER SUITABLE FOR FRAMING. PAPER SIZE 11" X 14". IMAGE SIZE 9" X 12". This listing is for a single vintage print from John Marin's body of work. It is of a watercolor titled Two-Master, Becalmed. ►Condition: This is a vintage print in like new condition. It has been kept in the original packaging since printing & distribution, away from light. No bends, tears, discoloration, or other issues. It will be shipped rolled in a wide tube. ►Shipping: Additional rolled paper items SHIP FOR FREE. Applies to domestic and international orders. ►Related: This store has several other John Marin prints from the same collection available, as well as a set of 5 prints. See the full description for links..
A Greenwich sunset glows as the smokey shadows turn into a giant silhouette. ♥ Prints are made from the original watercolor. ♥ They are printed on acid free photo paper with a protective coating. DEPICTING: Royal Navy, During The Naval Maneuvers, Gunboats. 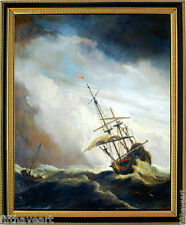 TITLE: During The Naval Maneuvers, by Bernard F. Gribble. CONDITION: Minor and normal signs of age. TITLE ~ Canada Montreal, Lachine Canal Closed For Spring Repairs. DEPICTING ~ Canada Montreal, Lachine Canal Closed For Spring Repairs. FROM ~ Canadian Illustrated News, Montreal Canada, 1876. CONDITION ~ Minor and normal signs of age. DESCRIPTION: Vintage Set of 4 1970's Lionel Barrymore Gold Foil Etch Nautical Prints. They come in the original Portfolio and each is a 8"x10". The prints are titled "Fishing Banks", "Seaworthy” “The Old Farm", and “Old Nantucket.” SIZE: 8" X 10" including matte. CONDITION: Estate find, good used condition, with little wear. PLEASE NOTE: The Top of each matte has a small indentation which most likely would not be seen when framed but wanted to mention anyhow. (Please see photos, as I have tried to clearly show.) Please feel free to message with any questions. Thank you very much! Cape Hatteras to the Outer Banks. She was spotted aground under full sail on Diamond Shoals in 1921. No trace of her captain or crew was ever found. TITLE: Bound For The Land Of The Moors, by Bernard F. Gribble. DEPICTING: Royal Navy, Bound For The Land Of The Moors. CONDITION: Minor and normal signs of age. Beautiful poster, hand signed. 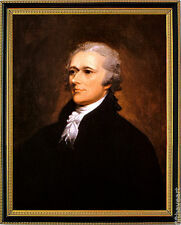 Yellowed slightly at edges, which would be invisible when framed. Shipped rolled in tube with USPS Priority Mail. Beautiful Alaskan Coastal Boat Digital Professional Photograph Print On Canvas. 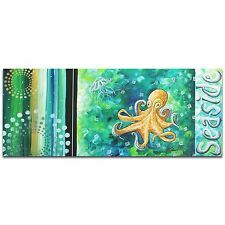 Canvas Size- W 16in. × H 24in. It comes in a black modern floating frame wired and ready to hang. Frame Size- W 17 1/2in. × H 25 1/2in. × D 1 1/2in. Condition-Like New. This beautiful print comes shipped USPS first class package. I also offer combined shipping on all items. Just ask! Archival-certified and OBA free, 20.5mil bright white, consistent poly-cotton blend matte canvas features an acid-free, neutral pH coating without any additives or agents. Canvas prints are designed to last well over 100 years, guaranteeing you’ll treasure your prints for a lifetime. 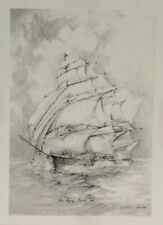 • 2 nautical prints by Charles Cerny signed 1959. • The prints are mounted on walnut and covered with a piece of thick lucite. Title - Sir Winston Churchill. Off Set Print - Texaco put these prints out about 20 years ago. Donna Elias Cape May Lighthouse Art Print NEW Double Matted Sealed 8.5" x 11"
This is a Donna Elias art print "Cape May Lighthouse". It is about 8.5" x 11". It is double matted and new and sealed. The only flaw I can find is a small corner crease on bottom right.Check out picture 5. Bjorn Landstrom was a Finnish artist, writer, graphic designer, illustrator, researcher and set designer for theatres. Artwork is dated 1971, however not sure when the print was made. Much easier and safer for everyone.